It’s Friday! Funday Friday, Halloween Friday, thank goodness it’s Friday! Can you tell that I’m glad it’s Friday? Well, in honor of it being Halloween, and also a Friday (how many times can I say Friday? ), I’m excited to share with you my last festive treat for the week. Instead of sharing a spider cupcake recipe or goblin juice punch (both of which I briefly thought of testing), I’ve decided to keep it simple and delicious. That’s the motto of Pumpkin ‘N Spice, right? If you’ve been hanging around here long enough, you know that I love creating easy, yet delicious recipes. I like putting my creativity to work and coming up with dishes that are both filling, yet simple, to throw together. And since Fridays always call for shortcuts in my book, I thought these Halloween Funfetti Cake Mix Cookies would be the perfect treat for you! I’m a big fan of cake mix cookies and have made them numerous times throughout the past years. They’re incredibly easy to whip up, requires ingredients that are already stocked in my kitchen, and are just plain ‘ole delicious. When my good friend Danielle over at Live Well Bake Often showcased her Cake Mix Cookies a while back, it made me remember how much I love this type of cookie. Simple ingredients, minimal prep time, and a delicious recipe that never fails. How can you pass that up? So because of Danielle and her tasty cake mix cookies, these Halloween cuties were born. And much like my Caramel Apple Cake Bars with Caramel Apple Frosting, they’re a breeze to whip up! Four ingredients is all it takes, friends! And because these Halloween Funfetti Cake Mix Cookies are so easy to bake, you can spend less time in the kitchen and more time passing out candy to those trick-or-treaters, helping your little ones trick-or-treat, or in my case, passing out candy while devouring these cookies! 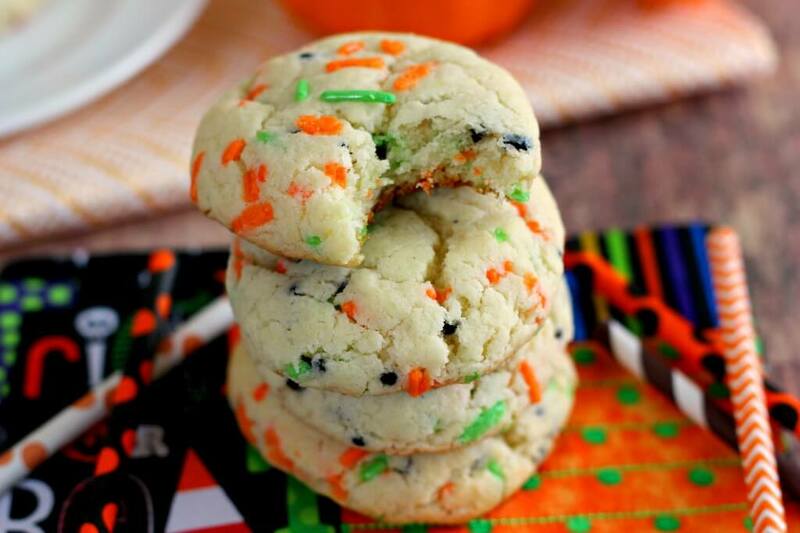 Soft, fluffy, and full of funfetti cake batter flavor, these Halloween Funfetti Cake Mix Cookies will delight your senses and showcase your Halloween spirit. So what are you waiting for? These cookies won’t last long, trust me! 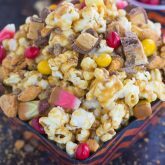 Looking for more Halloween snack recipes? I’ve got you covered! Soft, fluffy, and full of funfetti cake batter flavor, these Halloween Funfetti Cake Mix Cookies will delight your senses and showcase your Halloween spirit. Preheat oven to 375F. Line a baking sheet with parchment paper, silpat mat, or lightly coat with cooking spray. Set aside. In a large bowl, stir in the cake mix, oil and eggs until thoroughly combined. Fold in the sprinkles, if desired. Shape dough into rounded balls and place onto prepared baking sheet. Bake for 8-10 minutes or until edges are set. Remove from oven and let cool for 10 minutes, then move to wire rack to cool completely. Thanks, Arpita! These cookies are ready in minutes and taste wonderful! Happy Halloween to you, too! I love cake mix cookies, Gayle! I put candy corn in the ones I made recently, and I love how versatile they are. These look so gorgeous! Amazing photo shoot! 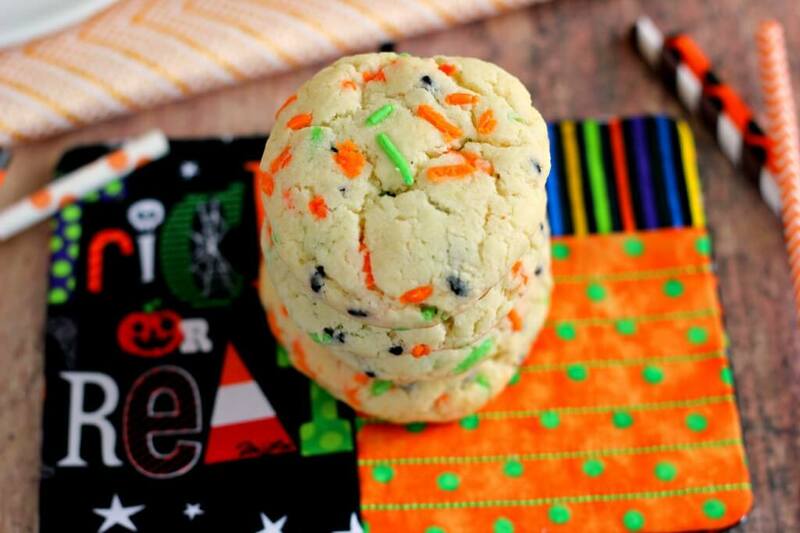 Candy corn sounds like a great addition to cake mix cookies! Thanks so much for the kind words, Mir! 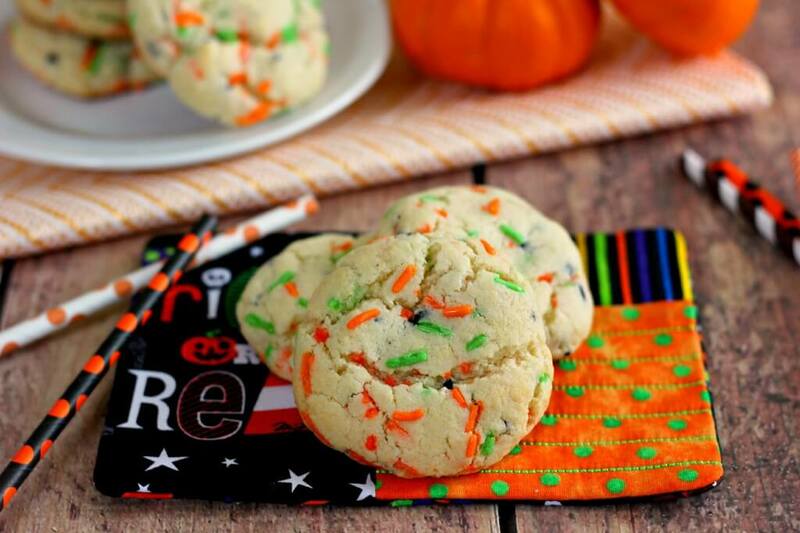 HAPPY Friday and Halloween Gayle ;-) these cookies look great! the center looks so soft! and nothing can beat a boxed recipe when it comes to saving time without sacrificing taste ;-) love these cookies! ... have fun handing out candy to the trick-or-treaters... although I don't know how many there will be? its 25 degrees in MN right now, now sure how cold it is where you are! have a great weekend! It's so cold where I live, too! It was even flurrying this morning, can you believe it?! I'm ready for the trick-or-treaters, so I hope some come, otherwise I'm "forced" to eat all of the candy! :) Thanks so much for the cookie love, Michele! I hope you have a great weekend! You know what's ridiculous? I have not EVERY had a cake mix cookie! I am the worst food blogger ever! But, funfetti is totally my love language so I need to get my mouth on these babies! Pinned! Oh man, you have to try them, Taylor! 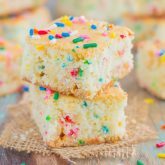 They're super easy to make, and funfetti makes them even better! :) Thanks so much for the cookie love and pin! Thanks so much, Laura! I always gravitate towards easier recipes when I'm looking for something, so I know other appreciate the same as well! And I also have a tendency to over bake things, too. Luckily, these cookies turned out delish! Have a great weekend! Happy Halloween and happy Friday! I've never made a cake mix cookie. I love the how easy they sound, though. Shortcuts are good, when the end result is still delicious. I need to try these soon! I love these Gayle! Totally agree with the simple and delicious moto. So easy, I'll definitely try them! Pinned! Happy Halloween! Thanks so much for the kind words and pin, Mira! These cookies couldn't be any easier or more delicious. Happy Halloween to you, too! Yay, Happy Halloween girl! Love these cookies, they're so pretty and festive! 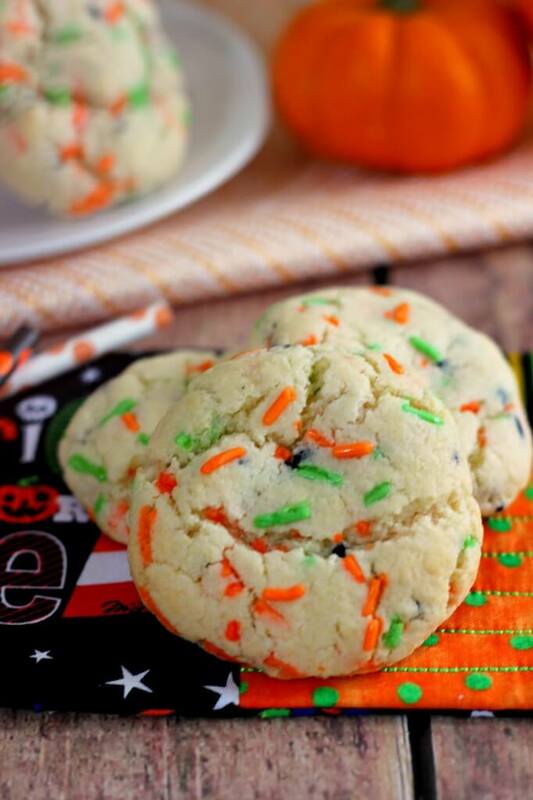 I wish I had a few of these cookies to snack on while I handed out candy, they sound fabulous! Pinned! Happy Halloween to you too, Kelly! Snacking on these cookies will help me stay away from all the candy! :) And thanks for the pin! Happy Halloween! And these cookies look beautiful and delicious! And not to mention so easy to make! Pinned! Happy Halloween Gayle! These cookies look fun and festive and also they are so easy to make! Pinned! Happy Halloween to you too, Manali! Thanks so much! I love adding extra sprinkles for color, too. The green and orange makes them so festive! Love how dense and tall these cookies baked. HappyHalloween! Ha ha these might just be a little better than chocolate! Thanks, Karen! Yay! You and The Frosted Vegan are twinning with your Halloween recipes :) I've never seen funfetti cookies before and these look amazing! Such a fun idea. Those look seriously fantastic! Love the ease of using a cake mix too - yum! How cute!! And easy, too! Happy Halloween!!! Thanks, Jess! Happy Halloween to you, too! My kiddos would love those! All the sprinkles, so fun. I don't think of adding sprinkles to things often enough! These sound delicious. Also, I've never made cake mix cookies. Where have I been that I didn't know that was a thing?! These are definitely kid-approved, Stacey! :) I need to add sprinkles to more goodies, too. I found some festive Halloween ones, so I knew I couldn't pass that up! And you should definitely try cake mix cookies. They're delish! 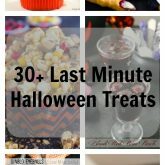 These look so tasty, Gayle, and perfect for Halloween! You just can't go wrong with festive, funfetti cookies! Thanks, Marcie! I'm a sucker for anything with funfetti flavors in it! love these pretty little festive cookies!! Have a great Halloween Gayle!! Thanks, Olivia! You must try these! They're so easy to whip up and so full of flavor, too! Ok good, I'm glad you didn't mind the overkill on Friday! :) Thanks for the kind words, Nicole! You know...I've never made cake mix cookies..what is my problem?! My kids would have loved these growing up!! Well, better late than never, I say! Thanks for this adorable idea! You should definitely try these cookies, Annie! They're ready in no time, and kid-approved, too! Thanks, Cailee! I had a blast making (and eating!) these cookies! Happy (belated) Halloween, Gayle :) These cookies look delicious, perfect for Halloween, and love how simple they are! Thanks so much, Denise! These cookies are so delicious for being so easy to throw together! Thanks, Sarah! I agree, a great cookie for the weekend! I <3 cake mix cookies! These are way too cute Gayle, double thumbs up! Pinning! Thanks so much for the pin, Mary Frances! And I agree, cake mix cookies are the best! Hope you had a Happy Halloween! 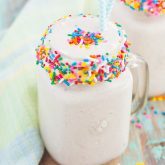 Love those green and orange sprinkles and the fact that only 4 ingredients are needed. Easy is always a plus! I just had to buy the Halloween sprinkles when I found them. Thanks so much for the kind words, Christin! These cookies are so fun! I love how easy they are! I hope you had a fantastic Halloween! I love all the bright colors in these photos! These cookies look so thick and moist and perfect! It isn't Halloween anymore, but I still want some right now! These are darling! Such a festive idea! Simple & delish are my favorite kinds of cookies. Already looking forward to your Thanksgiving & Christmas recipes in weeks to come. I forgot about funfetti cake mix cookies! I used to make them all the time in High School. So good! I'm going to have to make a batch right away to make up for lost time. Hope you had a great halloween Gayle! Aren't they the best cookies? I'm always amazed at how easy they are to whip up, too. Thanks for the kind words, Natalie!